A couple of fun challenges over at Splitcoast today. The TLC challenge is to use three neutrals and one pop of color and the CAS challenge is to use paper piercing. My card base is a standard A2 size with the bottom corners rounded. Next comes a smaller rectangle with the same bottom corners rounded. The butterflies were stamped in various shades of Hero Arts neutral colors and then the central butterfly was stamped in an aqua color. It’s been topped off with some Stickles for a little more interest. I used my piercing tool and mat to create the butterfly trail and used it on the sentiment also. Easy peasy less than 10 minute card! Have a marvelous week everyone! Back soon with more! Ooh, this is beautiful, Lee-Anne. What a great TLC challenge. I won't get to play in the challenge but I love it and will have to do this sometime. Both challenges look so fun. 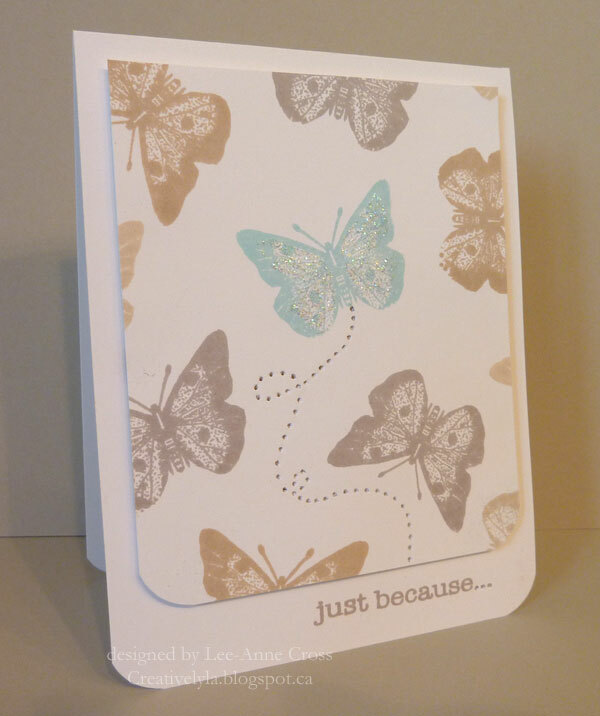 fantastic cas card Lee-Anne! Love the piercing and colors!